These quotes probably sound familiar. They are famous words (although the first one is often misquoted; people switch tears and sweat and leave out toil altogether). People remember them in part because they were spoken by important people during historically important times. But these quotes are famous also because of the way they sound. There is a distinct rhythm, a cadence, to each of these statements. This rhythm is due in part to parallelism, sometimes called parallel structure. But, what if Churchill had said it like this? I have nothing to offer but my blood, toiling, the tears I cry, and perspiration. No one would have remember those words for long. The difference lies in the list of things Churchill says he has to offer. In the actual quote, Churchill lists four one-syllable nouns: blood, toil, tears, sweat. In this awkward second version, there is a pronoun-noun combination (my blood), a present participle (toiling), a noun clause (the tears I cry), and a four-syllable noun (perspiration). There’s no rhythm. The idea is the same, but the power and music of the words disappears. Not Parallel: The students loved to run, play and swimming. Parallel: The students love to run, play and swim. Or: The students love running, playing, and swimming. The rule of parallelism goes for any kind of word list – including nouns, verbs, adjectives, or adverbs. Nouns: What impressed me about Alfred was his loyalty, determination and humility. Verbs: Julius swiveled, swooped and alley-ooped his way to NBA stardom. Adjectives: The evening sky seemed more vast, silent, and empty than ever. Adverbs: Lightly, gracefully, and majestically, the eagle descended. It’s not necessary to analyze all of your sentences this carefully. Parallelism usually happens by instinct. There’s just something natural about the sound of repeating word patterns. Everyone prepared for the big test in his own way. Evan was up past midnight. Chad arose before dawn. Evelyn didn’t sleep at all. Everyone prepared for the big test in their own way. Evan was up past midnight; Chad arose before dawn; Evelyn didn’t sleep at all. Most of us followed orders instantly. Frank began straightening his bunk, Louie started scrubbing the floor, Oscar set to polishing his shoes, but Nathan, apathetic, leaned against the wall with his arms folded. He wasn’t moving. Do you see how by breaking the parallelism in the bold sentence the reader’s attention is drawn to Nathan? He becomes the focus of the paragraph. Remember when listing words, phrases, and clauses to keep your lists parallel in grammatical form. Bloggers love comments! Leave yours below. Descriptive Writing Prompt: Guess Which Zoo Animal? Everything is very open with a clear clarification of the issues. It was really informative. Your site is very helpful. Many thanks for sharing! 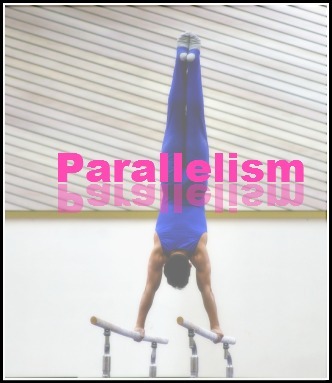 Although parallelism is of extreme importance, as a writing teacher I find it is among the most neglected topics. My grateful thanks for shining light on this aspect of writing!